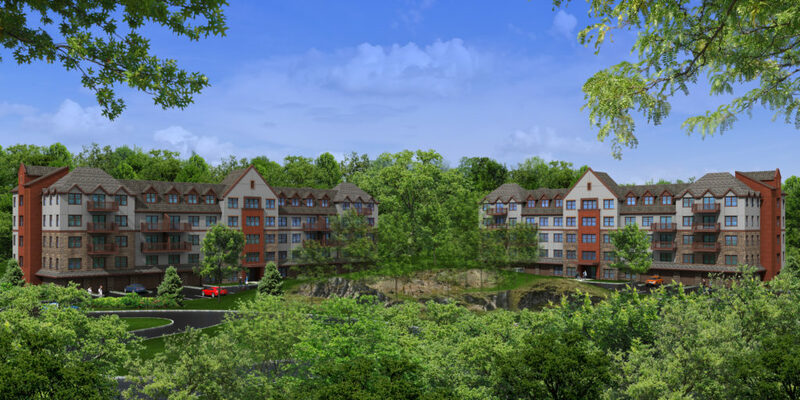 A rendering of the Fort Hill Apartments at the Abbey Inn development. PEEKSKILL—Ginsburg Development Companies, joined with City of Peekskill and Westchester County officials on June 13 in breaking ground on a $64.5-million mixed-use project that will transform the former St. Mary’s convent property into a resort-style tourist destination. The new development will include luxury rentals apartments as well as a spa, hotel and restaurant. Called “Fort Hill Apartments at the Abbey Inn,” the project will feature 178 luxury one-, two- and three-bedroom rental apartments in three, five-story buildings arranged in a quad around a wooded knoll. Located on the newly dedicated Fort Hill Road at John Street, the new buildings will complement the existing stone-and-brick structures, which were designed by prominent architects of the 1800s. Amenities will include a fitness center, club room and outdoor pool. Some of the apartments will have Hudson River views, GDC officials stated. GDC is donating 52 acres to expand the historic Fort Hill Park, which will feature a variety of existing and new hiking trails. The public park will include new features, including an observation deck to enhance the views of the Hudson River. 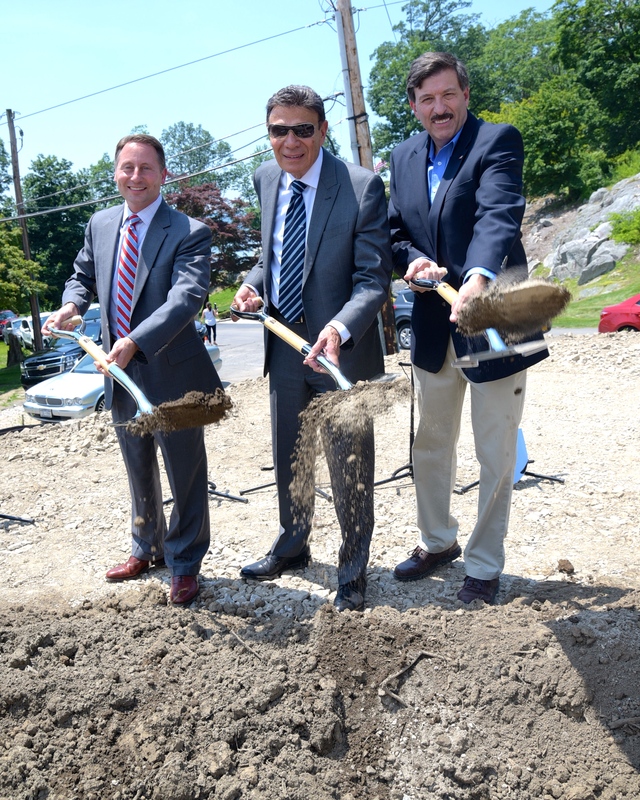 Pictured at the groundbreaking from left, Westchester County Executive Robert Astorino, GDC Principal Martin Ginsburg and Westchester County Legislator John Testa. In the past 12 months, GDC has opened four major luxury rental projects in Westchester County—the 330-unit River Tides at Greystone in Yonkers; the 188-unit Harbor Square on the Ossining waterfront; the 66-unit The Lofts on Saw Mill River in Hastings-on-Hudson, and The Metro, a 124-unit rental building in downtown White Plains. GDC is completing construction of 1177@Greystone, a new 55-unit luxury rental apartment building located in the Greystone neighborhood of Yonkers. The delivery of the project has been delayed due to a fire in May that destroyed approximately 50% of the units that were under construction at the time. GDC is also the developer of the Riverside at Harbors-at-Haverstraw, a 106-unit luxury rental building in Rockland County that opened two years ago.